Two men are facing a total of 27 charges in connection with an alleged attempted robbery and home invasion in Nova Scotia that prompted a police chase in New Brunswick. The RCMP say the men tried to commit a robbery and home invasion in Springhill, N.S. shortly before 5 p.m. Tuesday and then fled from police into New Brunswick. The RCMP in Nova Scotia contacted the RCMP in New Brunswick around 6:30 p.m. and asked for assistance in stopping the suspects’ vehicle, which was headed westbound on the Trans-Canada Highway. 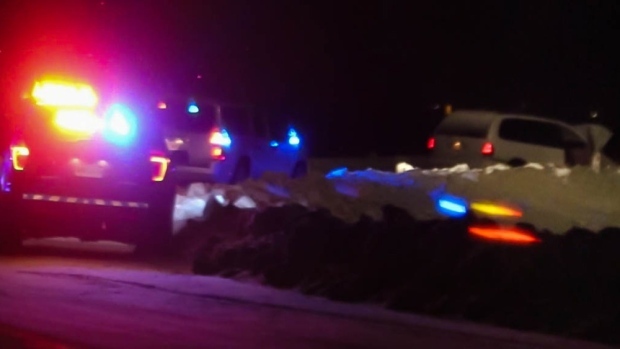 Police deployed a spike belt along the highway in Painsec, N.B., forcing the vehicle to come to a stop near Exit 467B. Police say the two suspects fled on foot, but a K9 unit tracked them down a short time later. They were arrested and taken to hospital for minor injuries and later released into police custody. A member of the New Brunswick RCMP was also injured while responding to the call and was treated in hospital and released. Christopher Glennie, 42, and Nathan O’Brien, 36, appeared in Moncton provincial court Wednesday. Glennie is facing 12 charges while O’Brien is facing 15 charges, which include fleeing from police, possession of a weapon for a dangerous purpose, possession of a firearm in a motor vehicle, and possession of property obtained by crime, among others. Glennie and O’Brien, who are both from Riverview, N.B., have been remanded into custody and are due back in court Friday for a bail hearing. Police say they are also expected to face additional charges related to the attempted robbery in Nova Scotia. Two men face charges after alleged home invasion in N.S., police chase in N.B.